Let’s Explore Penida Island with us ! We have a professional and experienced team to ensure your holiday runs smoothly and we have recommended the best destinations for you as well as your a memorable and enjoyable holiday package on the island of Nusa Penida. Penida Island is not far from sanur beach. Precisely located in Klungkung district, Bali Province. 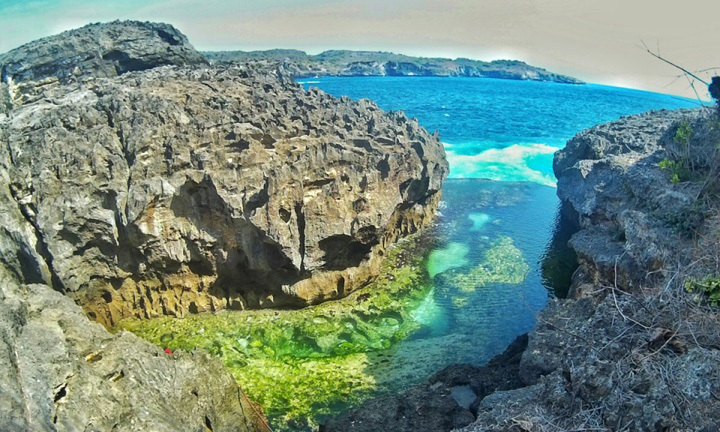 Angel’s Billabong is an offer of Nusa Penida Island. It is the final estuary of a river on the island of Nusa Penida which empties before the river to the ocean off. At the mouth of this river the water surface is very calm and clear. In addition there are also overdrafts that form a pond naturally be found elsewhere. Characteristic of artistic and rocky yellow green will add exoticism from Angel’s Billabong. Broken Beach Consists of a high cliff that jutted into the open sea and is composed of high cliffs that jut out into the open ocean. This beach has a cliff with a height of about 50-200 meters hollow in the middle, so it looks like a cave that flowed by sea water. Kelingking Beach is the one of the most special spot you can visit during the holidays to Nusa Penida Penida Island), local residents recognize this beach as Karang Dawa Beach. Visiting this Kelingking Beach will not make anyone bored. Moreover, this beach is still very natural. Karang Dawa which is characteristic of this Kelingking beach. But you have to be careful, because this cliff has no limits. Crystal Bay offers tranquility and comfort, away from the frenetic and noise. To see the view intact, visitors can go up the hill to the west by following hundreds of stairs. From there, it can see perfectly, bend of the bay with white sand that blends green coconut trees. Atoll clusters with temples at the top add to the beauty of the beach. in the behind of atoll, clearly visible Nusa Lembongan Island and Ceningan are only separated by narrow strait that is, Strait of Ceningan. If seen further, it turns Penida Beach area into a clean water supplier for the community of Nusa Penida with the existence of several springs that appear. These springs look bubbly and accommodated in large dams. Local Guide and lunch Box.